On the occasion of Israel’s 70th Anniversary, a major tribute show for Israel and its achievements will be held in Jerusalem at the Henry Crown Symphony Hall, the home of the Jerusalem Symphony Orchestra on May 13th, 2018 at 8:30pm. The evening will open with a special 70th Anniversary video tribute to Israel and greetings from Barbra Streisand and will feature top names in music led by iconic singer Pat Boone (“EXODUS” and “Speedy Gonzalez”) and the Jerusalem Symphony Orchestra as well as Shiri Maimon, the Israeli star of Eurovision 2005, Dino Kartsonakis, world renowned pianist and winner of 8 GMA Awards, and the outstanding Moran Choir. Additional names are being added this month. 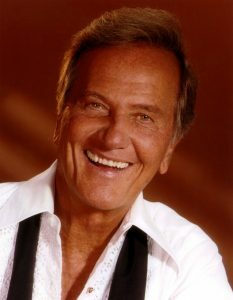 Renowned for six decades in show business (including 38 Top 40 hits), Pat Boone’s 51-plus years covers a myriad of genres from pop to country to rock n’ roll and gospel. While always trying to hit new heights, Boone, who has hosted several television variety shows augmenting his performing career, says “I’ve done more genres of music than anyone else and I’ve been on the charts in all of them, too.” Boone’s enduring career has parlayed into 45 million records sold and crossed over into a wide-arching movie career, appearing in 15 movies. Today, his record of 220 consecutive weeks on the Billboard charts with one or more songs is still unbeaten. In addition to the musical component of the evening, the audience will be treated to a presentation of the seven decades of Israel’s history by iconic presenters with a special focus on Israel’s numerous contributions to the world. The tribute will also include rare archival footage that will allow the audience to experience these modern day achievements and miracles. Presenters to include notables such as: Rabbi Yechiel Eckstein, Tal Brody, Natan Sharansky, Reverand Franklin Graham, Gordon Robertson, Pat Boone and a Youth Ambassador from Krembo Wings. The leaders of the pro-Israel groups, Rabbi Yechiel Eckstein of the International Fellowship of Christians and Jews, Gordon Robertson president of The Christian Broadcast Network (CBN), and Pat Boone Enterprises lead an impressive list of sponsors and supporters of the 70th Anniversary Gala Event participating in this historic concert. The Israel-based production will be presented by Krembo wings, the first youth movement in the world for children with special needs that will receive a percentage of the revenue of the evening and produced by Hangar 11 in association with Israel’s 70th Anniversary Gala Celebration, LLC, led by executive producers Dann Moss and Milt Suchin. Ticket will go on sale at http://tickets.bimot.co.il/ Ticket prices begin at 199ILS.